I had to dig this out for a proposal I'm doing with a friend, and thought you all might be interested in this. It's a modular of a different sort - it is one of many (in my case, three) "Performance Bug" devices that I use for certain kinds of performance. You start these up and "plant" them in the performance space; the programming (in Python, using a custom audio library I created) randomly captures, delays and replays audio snippets, thereby adding a sort of "memory" to the room. 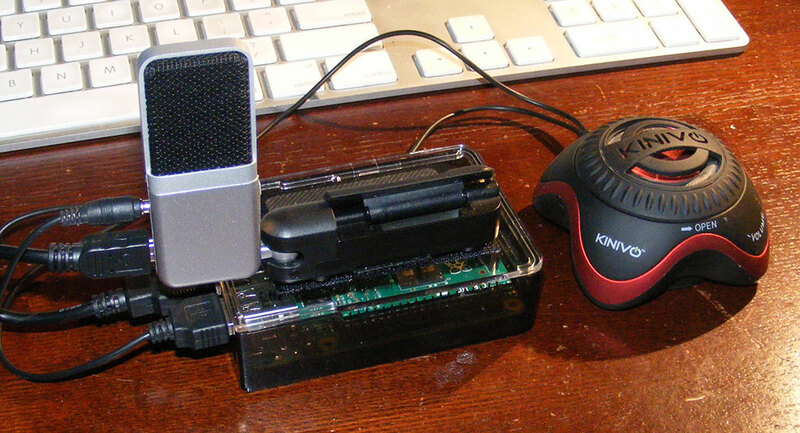 It's really a simple system, with a Raspberry Pi 2 (in an Adafruit enclosure), Samson Go Mic and Kinivo amplified speaker. The combo comes in at a little over $100, but is really powerful. I also have a little $10 wireless network bit in there that allows it to live on a network; the result is a group of devices that can talk to each other, potentially share sounds, and generally interact with the performers in unique ways. Very fun project, and something I'll be using more in the future. I want a voltage-controlled ADSR envelope. I know - they are part of the tyranny of the keyboard player, and I should be happy with an infinite number of Maths. But, alas, I sometimes want to sequence with an ADSR, and I'm in a quandry. And this is something that is too hard to do in Modular Grid. I want a VC-ADSR of a reasonable width, and a short enough depth that it'll fit in my Tiptop Station 252 case. I really want the VC part, because it provides for some interesting options in an otherwise static sequenced line. But I don't want goofy response curves, and I don't want goofy scaling of the controls. Basically, I want a simpler version of the Tiptop Z-4000 VC-ADSR, but without the odd scaling of controls - or the extra features like the unknowable Deviator. Does anyone know of something that might fit the bill? In less than, say, 12 HP? Am I dreaming the dreams of the stupid? Friday night, my friend Wally stopped by with a real box'o'fun - the Abstrakt Instruments Avalon. 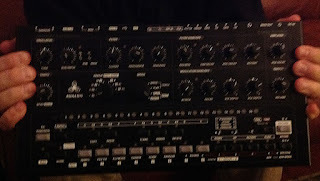 Here we have a fuzzy photo mainly provided to prove I actually got to put my hands on the thing. And man, it is fun. Unlike the x0xb0x, all of the controls are super-accessible, and the whole surface seems really well developed for "feel-based" editing and performing, rather than having to gawk at a screen or (especially) a computer screen. While I like the Octatrack and all, the Avalong is one of those boxes that you could love - and love it almost immediately. It also is as solid as a rock (Wally pointed out that it could be a great self-defense weapon). Open it up big to see it in action. This gives you a quick sense of how easy it is to create a simple modular system within Max 7. I'm going to be doing a few minutes video every month or so, so maybe subscribe to the newsletter or something to keep track. You can find the subscription thing at the bottom of the main Cycling '74 site. ... damned polyfuse. I purchased a bunch of Thonk kits for the Mikrophonie; it was my goal to 'finance' my purchase with the build-out and sale of several other kits. Alas, I got around to building 'my' Mikrophonie today, only to find that the kit was short one polyfuse. Sadly, I took it to the local electronics shop (JB Saunders in Boulder), and they looked at me like I just dropped in from Mars. "You called it a what? ", they said. "Is it resettable?". It's smaller than a pencil eraser, so no - it's not resettable. It seemed like I'd just walked into the General Store of some 50's sit-com, and the old guys were saying "You know, in my day, britches were made from that hard denim - why, you couldn't even skin a 'possum one these con-founded new things." Grrrr. Note to kit manufacturers: count twice, seal the bag once. In an effort to get a Mikrophonie for Really Cheap, I bought three of the kits, built all three, and am selling two to cover some of the cost. 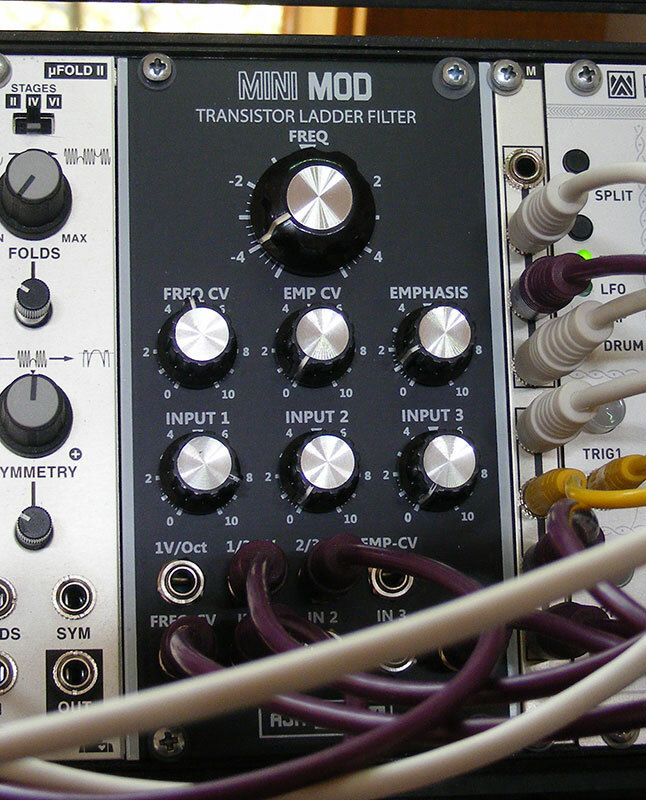 I'm definitely part of the first group, and with the rough front panel, simple finger-scratches and taps are a modulator of madness, and this actually gives you a reason to shout at your modular! Got problems at work? 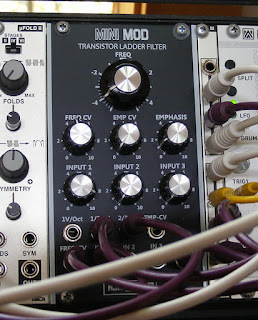 Take it out on your modular! Horrible commute every day? Scream into the little hole! Another custom piece that I want to share is actually a module that I use to manages a nightmare. Which nightmare? The nightmare of being thoughtful about exponential FM depth, and being musical about the whole thing. When I listen to people that are doing FM work, so often I hear 'full on' depth of the exponential FM input, or (at best) a little depth modulation of the incoming FM signal. I, personally, find that the depth of modulation is critical in creating a musical result, so I want high-precision control of depth for FM sound design. Chris Blarsky (of NINstruments fame) created another 10-turn wonder for me: a two-channel attenuator featuring a fairly firm 10-turn pot for each channel. Now, I can route my incoming FM signal into the TENuation module, very carefully tweak the depth of the signal, and use that for FM input. This is much more detailed than the typical tiny and 100-degree effective depth control built into most oscillators. You could do something similar with a multi-input attenuator (like my CV Tools, for example), but there is something about a 10-turn pot, a dedicated module, and a clean approach to FM modulation depth that really speaks to me. Wyatt and I just finished a build-out of three Radio Music modules; one for me, and two for sale. So if you are in the mood for a built RM (rather than a kit...), they are selling to friends/family/MW-people for $150/each without an SD card. One of the cool things about this is seeing Wyatt become a fantastic solder-monkey. He's been doing cabling for a local synth guy, and he's gotten to be a much better solderer than me. I think some of it is that his eyes actually work! I've really been having fun with my Radio Music - I'm using the standard downloadables from the RM site, but I tweaked the card init settings so that it does immediate resets on station change, so I can get rattling and shaking soundscapes by running through the sounds. One of the better uses of 4HP that you are going to find! 1. It's probably about live coding! Actually, it could be, but that's not where I found myself. It is actually more like coding a reaction to incoming events, and that takes planning. Also, there are some pretty extreme limitations (like, for example, the limit of only six lines of code for each trigger/system event), so planning/optimization is important. 2. It's probably like programming an ArdCore on the device! 3. I get it - it's a tracker! There's a tracker personality in there somewhere, but I didn't make it that far, because I started writing a weird-o shift register system and never came out of that k-hole. This is one of those cases where the limitations helped me push some personal limits, and the result was a wonderful little 4-note ASR with an internal clock. All in 10 line of code! So there you go - my first-day feelings about the Teletype. You can see a lot more people talking about (and learning about) the Teletype on the crazy lines (http://llllllll.co/) website that Brian Crabtree set up, or dig around MW to see what people are saying. But I had a hella good time! Well, I got my monome Teletype, and am going to start working with it over the weekend. But what have I done? Maybe got me an ArdCore++? Or something else? We'll see. I'll report once I figure it out! Side note: What the hell is it with monome modules and screw alignment. I get that most people have sliding-rail systems for module mounting, but the spec is available, and screw hole positioning should be possible. My other two monome modules are all chewed up by my Dremel-work; this one had slots that were *almost* in the right position, but I ended up cocking up a few screws trying to angle them in. HUFF!!! Most commercial loopers that I've used (or tried) have a fundamental problem for me: they will only loop in time. You create a 'master track', then every other loop that you record has to be some even-numbered multiple of that track length. This is great if you are trying to be Reggie Watts and making a tight beat. But what if you are doing a sloppy ambient piece, with drones sliding in and out to create a never-ending harmonic swill? Can't do it. I've gotten to the point of poring over user manuals before buying a looper so I don't get stuck with this problem. You see, I want to be able to choose whether or not loops are synchronized, and use the differing modes for different composing processes. So far, the biggest 'losers' are all Electro Harmonix loopers. I love the layout of these loopers, with their front panel mixers, easy bouncing functions and great sound. But there is no way to de-sync. The looper (i.e., Pickup Engine) in the Octatrack is similarly hamstrung, requiring all loops to slave to a master loop's length. Sorta-winners include the Boomerang looper pedal, which does have a de-linked mode, but is so non-visual as to be a complete head-fuque. 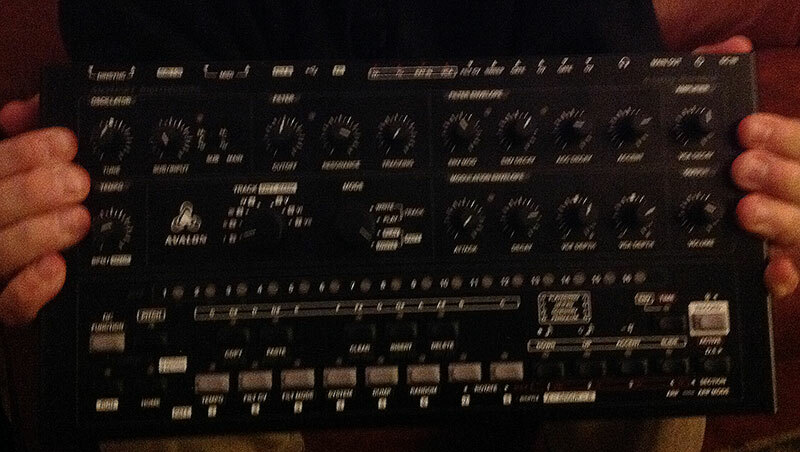 Much better is the Boss RC-505 - a device I was using until recently. It has the most flexible looping engine I've ever worked with, but is combined with some of the worst internal effects I've ever heard in a Boss unit. I'm currently experimenting further with the Octatrack; rather than using its Pickup Engine loopers, I'm trying to get comfortable with live sampling into the standard sampling engines and working with that. Not sure it'll work, but I'm trying. Do you have a looper that you love? Does it do de-linked looping? If so, let me know your experiences - I'm all ears!! !